Hi there. Missed you posting. LOVE the pictures - everything looks so nice. Such sweet babies. Hope your puppers is doing much better - what a cutey. Time flies when your having fun - so that says a lot about your life! Look forward to more posts. Have a fantastic week. Your grands are adorable! I would love to be a fly on the wall when those Facetime discussions are happening. The quilt for your sister-in-law is gorgeous! Wonderful colors and placement. Bad Pen pen where have you been? So happy to see your post. Hi, Penny--if not for your comments on my posts, I would have been worried. Nice to catch up on your doings. So many fun things here. I love the lighted holiday items on your newly backsplashed counter--and the nightlight. What a cool idea! I can hardly stand to put the last of the white Christmas lights away--I love the cozy glow when night closes in. That is a cool paper towel holder! Don't you love thrifting? The puppy dog look is soul searching! A very happy quilt for your SIL. When you figure out where the time goes would you please let me know so that I can find some too?!? Your precious little ones are growing much too quickly, I know the feeling-- it's my fault, I blinked. So very good to see you and I enjoyed your update! That backsplash is very nice and happy for puppers too! Love all your pictures! That picture with Granddaddy is priceless! Your new backsplash is beautiful. I love anything by Pioneer Woman so I really like how you use this piece for a night light. Very cozy against the backsplash. I love the quilt you made for your sister in law! Yall are so cute. Can't believe Annabelle is almost 4! She is adorable with the rollers in her hair. You always, always, inspire me! I need to get busy! Wow. I was thinking about you earlier today! I haven't been blogging for a few months, and I'm trying to get ambitious enough to get back to it. Was it hard for you? Looks like you've been leading a good life. Oh you quilt...I so want to someday. They are beautiful. So is your backsplash. So nicely done. When we get something new I just can't stop looking at it! I bet you are the same. Your new back spash is very pretty. I would like something similar but it isn't going to happen. I like your tile as it does not overwhelm and has interest being set on the diagonal. Gosh I can't believe it's been so long since I've read blogs, yikes - your little granddaughter is SO DARLING, love those huge curlers, lol! 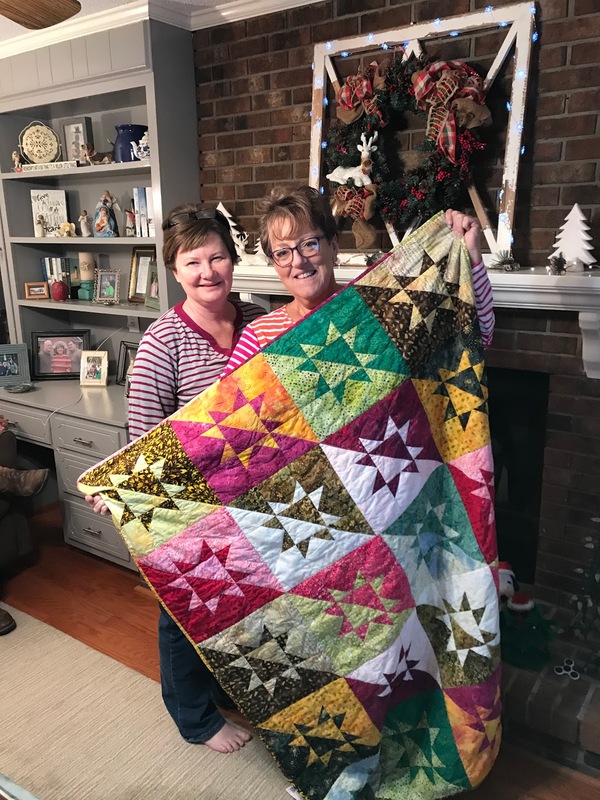 The quilt you made for your sister-in-law is gorgeous. love your new backsplash! !